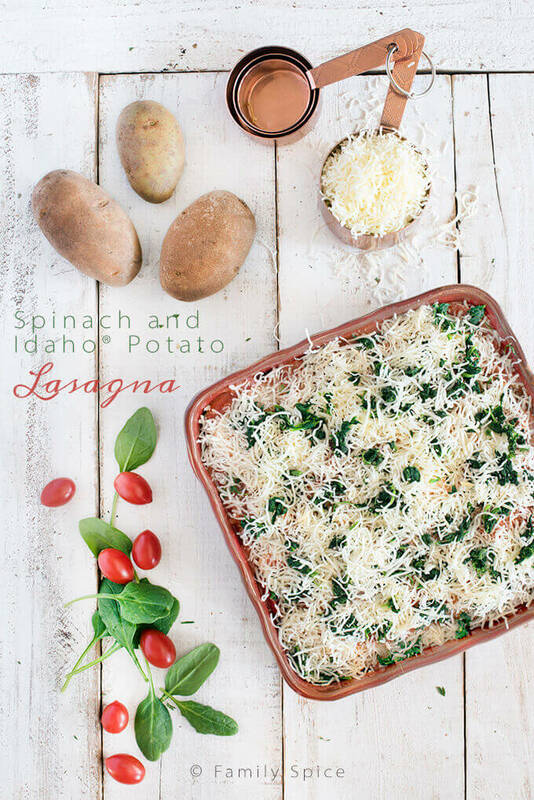 This Spinach and Idaho® Potato Lasagna is super easy to assemble, very filling and economical, too. You may never go back to a noodle based lasagna again! Sponsored by the Idaho Potato Commission. This is the last recipe that I am sharing with you for the promotion with the Idaho Potato Commission, where I was asked to develop four recipes using a 10-pound bag of Idaho Potatoes that would feed a family of four for $25. So far I have shared my Chicken Pot Shepard’s Pie, my Potato Gumbo and also my Sheet Pan Spatchcocked Chicken and Vegetables. 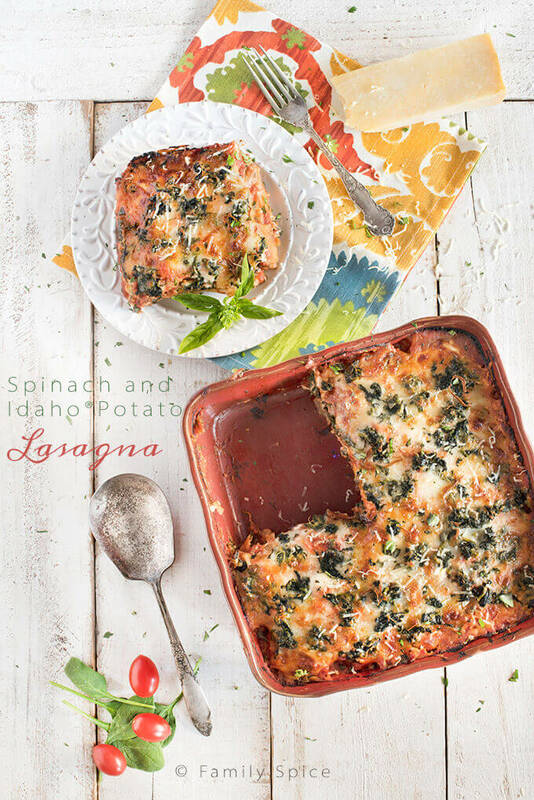 Today I am sharing a vegetarian recipe and it is perfect for Meatless Monday: Spinach and Idaho® Potato Lasagna. The concept for a potato lasagna is simple. Create all the flavors we love in a traditional lasagna and make it healthier and gluten-free by substituting lasagna noodles with sliced potatoes, almost like a scalloped potato dish gone wild! You do not need to parboil the potatoes or mess up any other pots and pans for this dish. This is another one of those one-pan dishes, which makes for easy cooking and easy cleaning. This recipe also yields four hearty servings. You won’t go hungry with this meatless dish. The key to the success of this dish is the even slicing of your potatoes. You want them thinly sliced, no greater than 1/8-inch thick. This way, they are cooked completely after baking for 45 minutes in the oven. A mandolin can slice your potatoes easily enough, but you can also use a sharp knife, which I did here. I also used store-bought marinara sauce, which you can almost always find on sale. Feel free to make your own, too. Just like traditional lasagna, you have to layer in all the ingredients: marinara, potatoes, spinach, ricotta and mozzarella. The layers bake together to make a cheesy lasagna that is just as good, and I think better than the noodled lasagna. 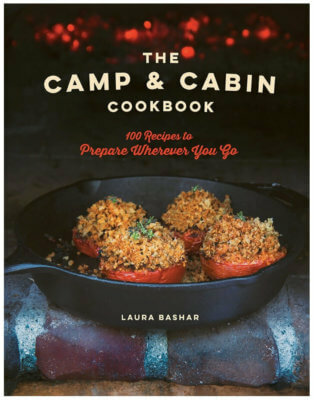 This is a very forgiving recipe and it is very easy to customize to your personal tastes. 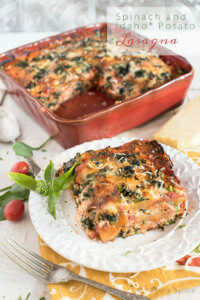 You can add more spinach and cheese, even use a meat-based marinara sauce. If you have any leftover bacon or Italian sausage, you can crumble it up and add it to the layers, too. Of the four dishes I made for $25, this potato lasagna cost about $7.00. Cheese can be pricey, so finding it on sale or buying it in bulk and freezing it makes it affordable. I hope you enjoyed these potato recipes and try them for yourselves. These posts should convince you that eating healthy, delicious food on a budget isn’t that difficult to manage. It just takes a little planning and creative thinking to get it done! 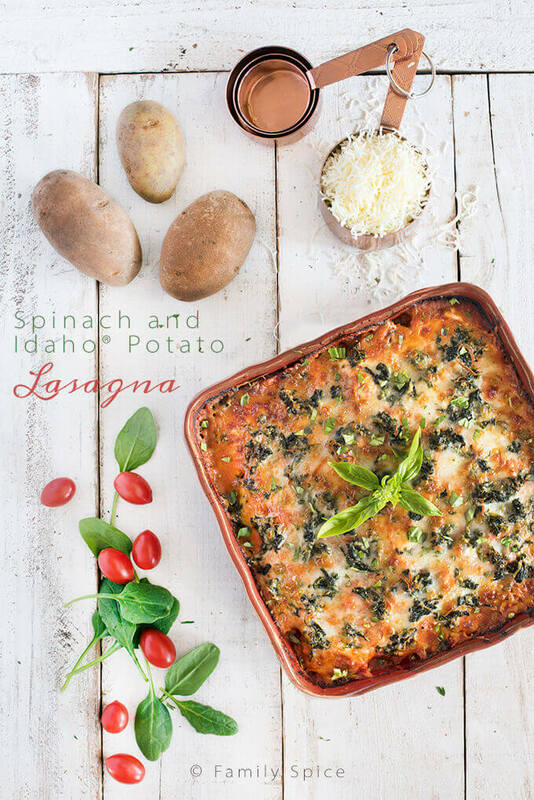 This Spinach and Idaho® Potato Lasagna is super easy to assemble, very filling and economical, too. You may never go back to a noodle based lasagna again! 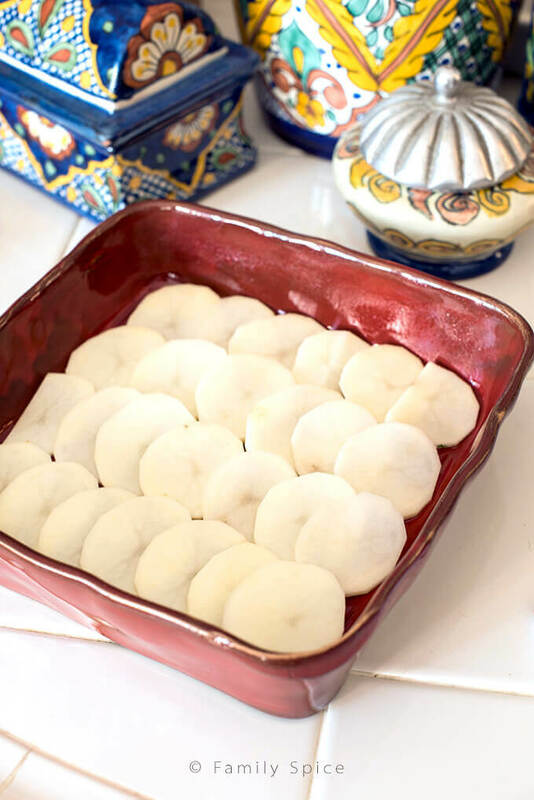 Cut potatoes into 1/8-inch thick slices. Layer bottom of pan with one layer of potato slices, overlapping slightly. Season potatoes lightly with salt. Spoon 1 cup of marinara evenly over potato slices, spreading the sauce evenly to cover potatoes completely. Dab approximately 2 oz of ricotta cheese evenly over the marinara sauce.Use the back of a spoon to press ricotta flat and spread evenly over marinara. Sprinkle approximately 1/3 cup of shredded cheese over the ricotta. Sprinkle 1/3 of the spinach over the cheese. Over the spinach, add a second layer of potato slices, overlapping slightly. Continue with the salt, marinara, ricotta, shredded cheese and spinach. Add a final layer of potato slices, overlapping slightly. Continue with the remaining salt and marinara, but this time add spinach before the ricotta, then top with shredded cheese. Remove foil and bake an additional 15 minutes until cheese is browned and bubbly. Love the potato spin! Great idea!